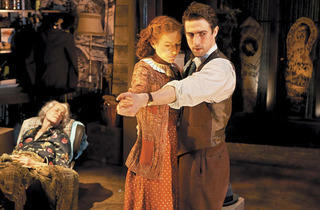 Lookingglass’s latest is a haunting, heartbreaking tale of memory and loss. The mood was ebullient at the opening of Lookingglass’s latest, which premiered the night after the group collected the 2011 Regional Theatre Tony Award in New York. Though the elegiac content of the show quickly sobers high spirits, its technically deft, emotionally affecting execution makes a strong case justifying the American Theatre Wing’s accolade. This time, Lookingglass applies its penchant for inventive stage spectacle to telling a heartbreaking tale of memory and loss. 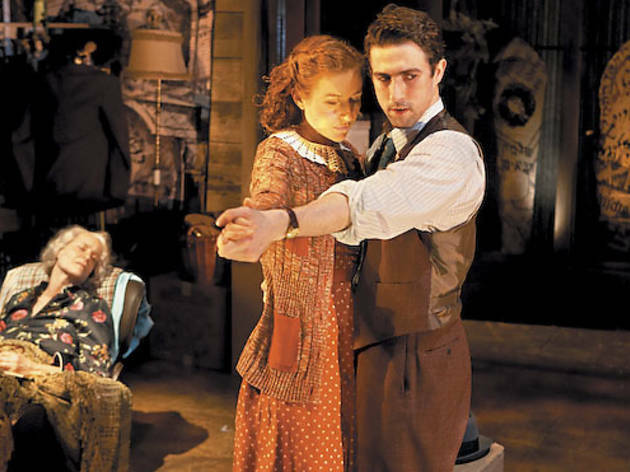 In the waning days of her life, Lilith, an 87-year-old Jewish immigrant (played by Frank, in spitfire mode), receives a visitation from the spirit of her first love, Ben (Bone), a showman who performs ribald folk tales and Bible stories with the help of a pasteboard toy theater (enchantingly designed by Tracy Otwell). In overlapping scenes, we see Lilith as an elderly woman arguing with her Pakistani home nurse (Ally) and as a headstrong young woman, Lilka (Fiffer), meeting Ben and reluctantly agreeing to help him write a play about King Solomon and the Queen of Sheba. As Ben and Lilka sweetly, gingerly start a romance, we forget for a while that this is Warsaw in 1939 and that Hitler’s tanks will soon crush their world underfoot. Kersnar’s staging beautifully underscores the story’s haunting themes with flashes of otherworldly effects and an ingenious dual-use set by Jacqueline and Richard Penrod. Past and present unfold at the same time, emphasizing the nearness of Lilith’s memories and her unbridgeable distance from the people in them.